Slather on the sunscreen, slide on your flip-flops, and grab some beach gear for the short trek across the street to surf and sand. 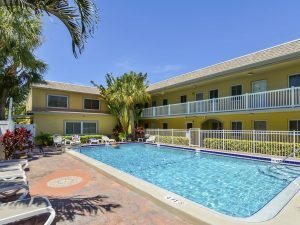 This second-floor 2BR/2BA St. Pete condo is also close to plenty of dining options including Shell’s Seafood, Sandra’s German, and La Casa Del Pane. Park your car and leave the keys on the counter—you’re within walking distance to quaint shops where you are sure to find the perfect souvenir and great beach gear. When the sun sets, check out the nearby nightlife.